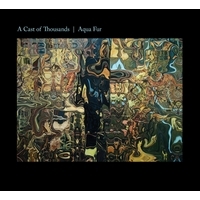 A Cast of Thousands is a trio from Auburn, New York. Comprised of a librarian, a vocational teacher, and a maintenance worker A Cast of Thousands is an unapologetic local band. They are loyal to their geographic, social, and political realities and create collagist portraits and landscapes that elevate everyday life. An associate of the band says, "they have contemporaries, but not around here." Their songs have been described as "barnstormers", "simple stabs at precious pop", with a "rough and ready sonic immediacy." They've recorded three albums - A Cast of Thousands, Aqua Fur, and most recently Alone in the Crowd. Jack Rabid from The Big Takeover described their latest release "as organic and free of fatteners as a Portlandia free-range chicken, 'Alone' is good and plenty."